A Wassell replacement carburettor for four stroke applications. This has a 24mm bore and comes as standard with a 140 main jet, throttle slide no.3 and a 106 needle jet. The pilot jet is a fixed bush, and it comes complete with the choke assemby, which can be removed if not required. Available in left and right hand versions. These new Wassell carburettors come with what they call a passivated fuel stain and corrosion resistant finish. They are also fitted with the Wassell fully adjustable float, but it is unlikely to need adjustment unless you are mounting the carburettor at an extreme angle. I can jet this carburettor to your specific requirements, please choose your preferred jet sizes from the option lists below. 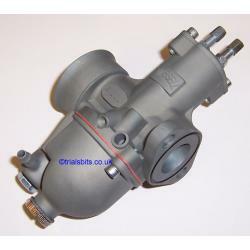 This does not add any cost, but may add a little time to the despatch of your carburettor.